They say don’t believe everything you read on the internet. Well, sometimes those rumors actually do come true. We reported just a few weeks ago that Twilio was looking to launch its own Cloud Contact Center Solution, known as Flex. Lo-and-behold, Twilio has done exactly that — today at Enterprise Connect, the Cloud API provider went ahead and announced Flex officially. 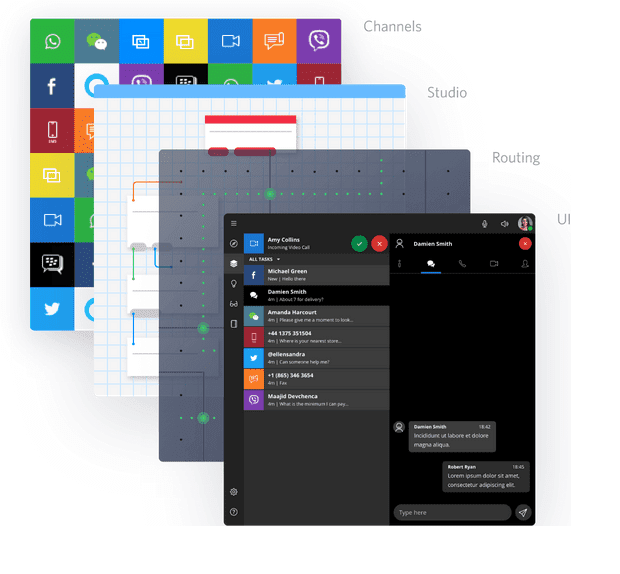 Designed as a programmable cloud contact center platform, Flex takes existing Twilio functionality and solutions, and wraps it’s all up neatly into a beautiful, simple graphical user interface. We haven’t had a chance to go hands-on just yet, but we wanted to take a closer look at exactly what Flex is, and what the solution has to offer for organizations in need of a truly flexible contact center solution. Flex, of course, is also capable of integrating with existing solutions, particularly CRM software, empowering your agents with more context to provide the best support possible. Overall, Flex is built on top of Twilio’s existing Super Network foundation, powering more than 40 billion interactions annually. And this is really just to name a few, you can check out the full list on Twilio’s page here. 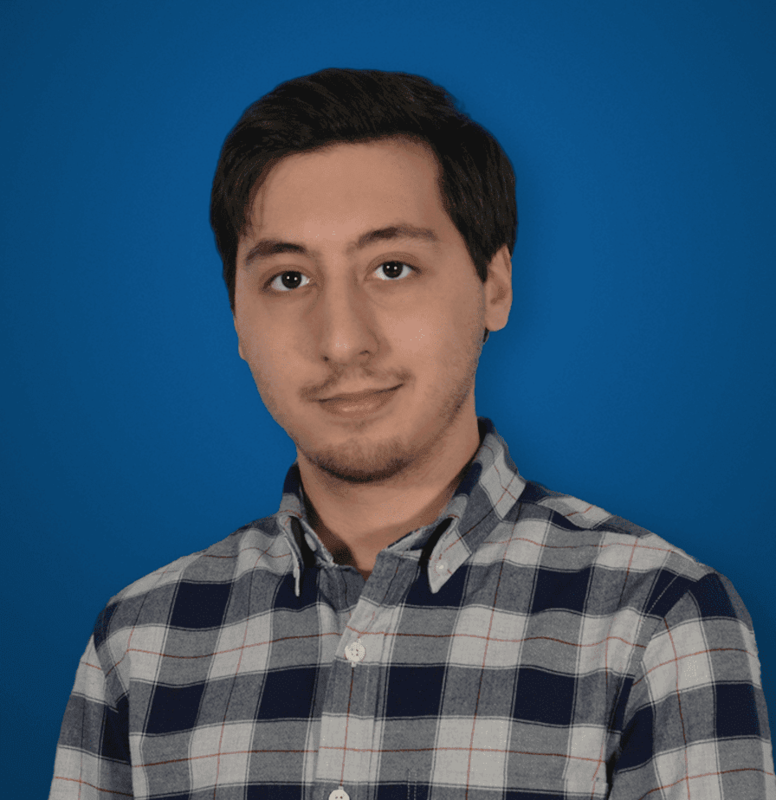 With an impressive feature list, Flex already seems like a solution to rival the existing industry leaders, especially with the Twilio name and infrastructure backing it all up. The main selling point of Flex, is of course, the flexibility that it provides. 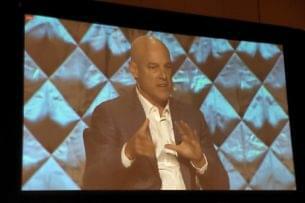 Twilio explains that the solution comes completely capable right out of the box and can be deployed instantly. But, for those that need a customized approach, Twilio claims that you can “program every pixel to your specifications,” which sounds incredibly powerful. 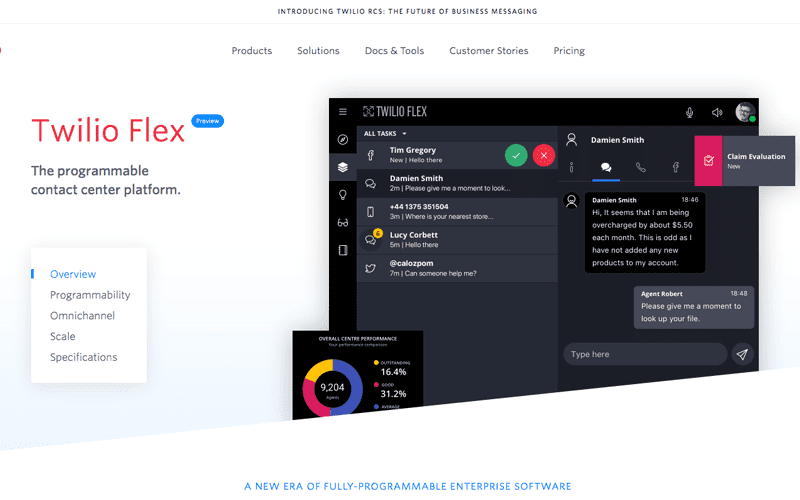 In fact, Twilio explains that “Flex’s UI is designed to be deconstructed, down to its micro-components.” This is the flexibility that enables your organization to construct the perfect contact center solution that fits your own unique needs. Twilio calls this Flex’s “micro-component architecture,” which enables users to add, remove or customize any and every aspect of the platform. 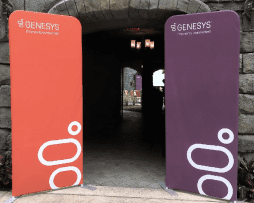 This flexibility extends beyond just the interface and visual elements, but also extends to core functionality of the solution — specifically with call routing. Twilio has made call routing as simple as possible, with a “powerful programmatic interface” that enables users to modify routes based on skills, steps in the customer journey, and even machine-learning logic — simply utilize TaskRouter to “programmatically route the right call to the right agent based on customer interaction data generated on the platform.” No human oversight is even needed, according to Twilio. 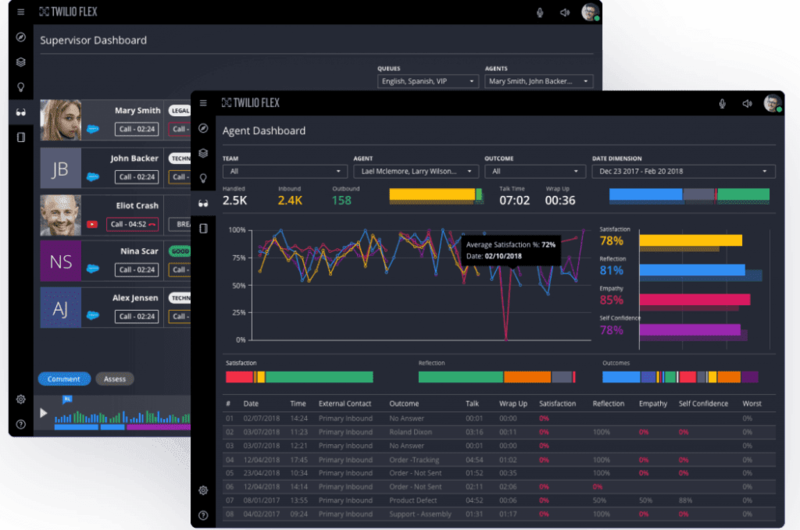 But beyond the ability to customize the visual elements, as well as agent routing, Twilio also included in Flex an intelligent workflow engine. This means that every single interaction that runs through Flex will “invoke a workflow that can be controlled with a simple drag and drop” interface, known as Studio. Studio is Twilio’s visual workflow editor. Essentially, Studio enables users to “pipe data” from your own sources, like a CRM, to provide specific, contextual information to your agent. So what does all of this mean? Essentially, your agents can create their own custom intelligent workflows, empowering them with the right information and context to best serve each call. So for example, if an agent answers a phone call, and that customer is calling about an open ticket, your agent could have Flex provide them with that context as soon as the call is answered. And the beauty of these workflows, like the rest of Flex, is just how flexible they truly are. Since everything is handled through a visual editor, any user has the power to create their own workflows with any coding knowledge necessary, and users can even add their own code to Studio’s communication flow to create their own unique widgets for use by anyone else in your organization. And of course, it’s also worth mentioning that Twilio’s Flex solution will come out of the box as a truly, full-fledged omnichannel contact center. This means more than just voice and text support, but also social media platforms, social messengers, and even more unique options like picture messaging, augmented reality in video conferences, and even screen sharing capabilities. The flexibility is absolutely where Twilio has an edge above the competition, and I would argue that channel support is another area as well. We have yet to see another solution seamlessly include so many unique communications channels all into one platform. Flex also makes it possible for agents to transfer their conversation from one channel to another, enabling agents to serve client’s in the best way possible. Its always interesting to see when rumors come true. And while the news is still fresh, it would be fairly safe to say that Twilio’s Flex solution will cause quite a big splash in the Contact Center as a Service market. The solution offers everything that we see in competitors, and only continues to go even further with entirely new functionality. I am very curious to go hands on with Flex to see how flexible it truly is. 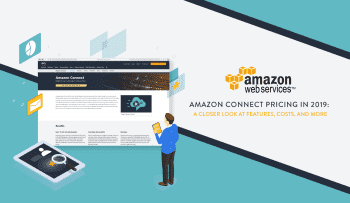 As a major selling point of the platform, I am curious to see how easy it will be for users to customize and create their own solution, much like how I went hands on with Amazon Connect when that was first introduced. Only time will tell, but if Twilio’s existing success is anything to go off of, Flex looks like it will be standing strong.